In this post I share the importance of keeping the big picture in mind when researching conspiracies. The Christian worldview (my bias if you will) sets the stage for interpreting reality through the eyes of a world created by a good God, but where evil too exists, and the ‘power/money trip’ that Jesus passed up on, has been taken up by others, thus much of the ‘mainstream’ conspiracies appear to stack up. Enjoy! There comes a time in conspiracy research where so many paradigms are challenged (the ones generally instilled in us by our upbringing, culture and other primary influencers) that we can sometimes wonder which way is up. What the heck IS the truth or for real? Fortunately I’ve managed to push through the inevitable struggles of independent thinking and of asking those uncomfortable questions and have survived. A quick check every now and then of my non negotiables of truth actually comes down to very few that actually matter. The more down or depressed I may be feeling, the shorter that list. The more that I feel on top of things, the more is on that list! My identity as a person is interwoven with my gender, genetic make-up, personality, and as a Christian the conversion experience in which (for the want of better words) I was ‘zapped’ with the recognition that not only was the Bible true, but that it was THE truth. The challenge for us all is to divine reality in an imperfect world, ourselves being a work in progress as well as struggling with those delightful little idiosyncrasies caused by our pride. The bible doesn’t pull any punches and calls them sin. I was challenged recently when a guy I’ve been communicating with long-distance shared his understanding of conspiracies that didn’t match with mine. This wouldn’t normally be a problem for me in the slightest, for when I’ve done the research in depth and actually formed an opinion, it takes a lot to ‘undo’ that opinion. So I’m usually not pushed around by what others think, but in this case I had enormous respect for some aspects of his writing and his understanding of some issues, so much so that I had to stop myself drawing into ‘worship-mode’ of his words! I saw that his take on the subjects that I raised however showed quite a shallow understanding of some things. This is the quandry we all have when researching a subject. Someone may have deep knowledge of one discipline, and yet drop the ball in another totally. Siloed learning, where educational processes are now [deliberately] designed to lead us into deep, narrow areas of expertise, is the norm now but it opens us to manipulation and deception from those who establish and control the system. Specialisation is for insects and brain surgeons, not thinkers and real people like you and me. So where and what is up? And how can we determine reality when we confront experts in one area yet who are comparatively blind or fooled in another? The lot of a thinking Christian conspiracy researcher is not easy. Not only do we have to deal with what really happened on 9-11, or at Pearl Harbour, Tonkin, Sandy Hook or Auschwitz, we have to integrate it with a plethora of wisdom, guidance and stories of the past and future in that delightful challenge called the Scriptures. This then is both challenge and opportunity, for taking the bible to be truth, simplifies the process of divining reality and understanding the world around us enormously. While I did appreciate his take on many things, some of them quite revolutionary for me, I did however have real misgivings about his recommendations and commentary on geopolitics. His take on the existence and activities of the Illuminati was essentially that he was aware that there was talk of conspiracy ideas but he couldn’t see much evidence of them and so pretty much wrote them off. His observations that the bankers too lost enormous wealth in the depression negated any claims of a conspiracy. I felt that he was susceptible to the mantras peddled by the MSM and missed hidden agendas and influences. He compounded this situation in my eyes too with the belief that it was far better to talk about what God promises and says, than to focus on the devil and thus glorify him. Now that’s VERY wise, for speaking about evil without the context of a loving God who deliberately gives us freewill choice; who dealt with sin once and for all on the cross – can very easily do exactly that – glorify it. But I’ve done the research, thousands of hours of it over several decades and at a big picture level most of the main conspiracy theories match the bible EXACTLY. The big picture is that God made the world. Something went very badly wrong, and the wheels fell off as a direct result of what God’s creation chose to do. From there the devil had a field day messing with something made good, until in the right time and place, Jesus stepped into the whole scheme of things and sorted it, once and for all. We’re working through the matters now and have been for 2,000 years, but the temptation to do wrong/bad/evil still does exist, and for whatever reason people still do choose to do their own thing; to rebel against God’s best and to do what they choose to do for their own self-interest. Christ refused the devil’s offer to have control of the world but . . . others haven’t. The important point in Jesus’ temptation was that Jesus never denied the devil what was his by right. It would not have been a temptation if the devil did not have the legal right to offer the kingdom of the world to Jesus. The offer of power then, was genuine. Consolidation of power, through the use of debt-based monetary systems (usury is ungodly) is the natural outworking of people dedicated to Satanic worship. 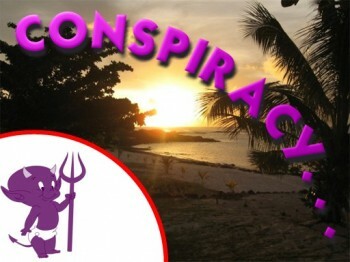 Conspiracy theorists claim that the world is actually ruled by a shadow leadership, satanic worshiping, supra-national dynastic families with 13 bloodlines – the international banking cartel a.k.a. the Illuminati. Population control, global government and Orwellian plans are supposedly being put in place as we speak. All this is being outworked through the United Nations and a plethora of sister organisations variously involving the Pope, secret societies, intelligence agencies, strong Jewish involvement and more. My biblical worldview gives me a big-picture advantage and is validated when what I see and hear around me matches. My research validates almost all the mainstream conspiracy claims. I differ when it comes to the more occultic claims and UFOs, aliens and so on, but I have definitely seen sufficient evidence in the last three decades to have founded my opinions on more than just one crazy source of gossip! It is my experience that there are too many paradigms that need to be knocked off their pedestals for any one person to get it all in one go. I certainly don’t have everything sussed out, BUT with the big picture clearly in mind, we can compare what we see with our own eyes, what we strike in life around us day-to-day to put it all together intelligently. If something is creating a lot of noise; if there is a ‘fear factor’ intertwined; if there is commercialisation and big business interests, politicising and manipulation of the people; debt with interest (no matter how ‘soft’ the loans might be); the rich getting richer and the poor, poorer then these are just some of the things that alert me to a hidden hand, a conspiracy. As each onionskin is pealed away, we hurt; we are unsettled as we realise yet still more how much evil there is out there. But the other side is that as we grow our knowledge and understanding of evil, I’ve noted that we MUST also have a commensurate growth in understanding the goodness of God; His enormous love for us, AND the all-important understanding that it is He who is in total control of world affairs, and the others are just deluded! If we don’t, then of course we will succomb ourselves, the fear of which unfortunately motivates some to avoid the study of evil. With Christ’s conquering of Satan’s power on the cross, the nonsense that goes on for fact around the globe can easily be seen for what it is – hot air, just actors on a stage. Just like one little old Catholic nun in the slums of Calcutta can make an enormous difference to hundreds of lives (and influence millions around the globe over an entire generation), so too can the Holy Spirit, working in the life of just one faith-filled, obedient servant of Christ confound the greatest, most powerful armies in the world, if the Lord wills it! I may disagree with my friend on the details of the extent of conspiracy in the global business, banking and political scene. My research says it’s bad, and my bible tells me that the big picture is bad too, but it also tells me that when we all one-by-one are obedient and do what He asks of us, then the enemy is rendered totally powerless! My advice is to get the big picture from The Book, and look around the world and work things out as they really are. If that means calling us conspiracy theorists, then, bring it on!